Connie Prince Digital Scrapbooking News: More radiant CT inspiration plus a FREEBIE! More radiant CT inspiration plus a FREEBIE! Gotta Grab It continues today at Gotta Pixel - don't forget to pick up Connie's FIVE fabulous GGI packs for only $1 each! Radiant In Red is an amazing new collection and Connie's CT worked absolute magic with it - here are some lovelies on which to feast your eyes. 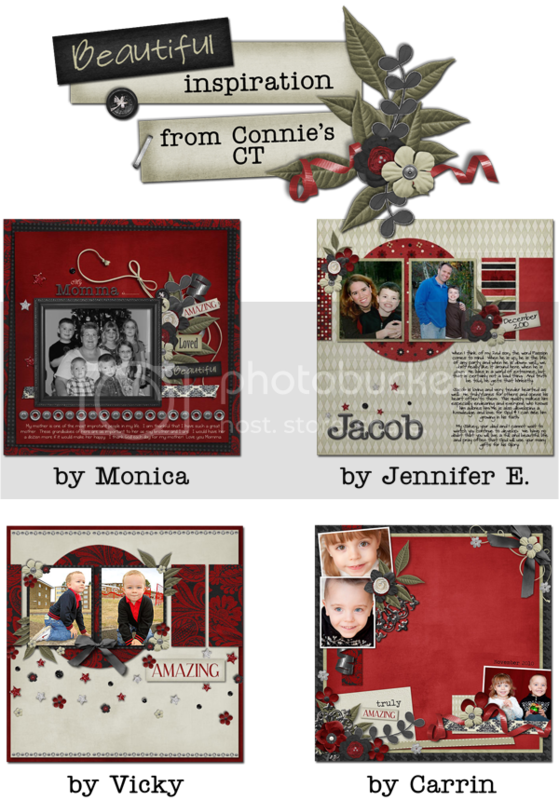 For today's freebie, we've got a gorgeous QP from Cate using Connie's Do-It-Yourself kit. This is such a fun kit and Cate has done a great job putting this page together! Please leave Cate and Connie some love if you download - we do appreciate your comments. Thank you so much for this post. I want to let you know that I posted a link to your blog in CBH Digital Scrapbooking Freebies, under the Page 7 post on Dec. 12, 2010. Thanks again. What a beautiful gift! Thank you very much!